Mathematics is the study of topics such as quantity, structure, space and change. Mathematics provides a means to represent the real world in the form of numbers, relationships and equations. Machine Learning (ML) and Artificial Intelligence (AI) are changing the landscape of computing around the world, allowing us to do things with computers that were previously thought to be nearly impossible. ML/AI systems are now able to hear, speak, see, touch and interact with the environment and people around them. In this article, I'll treat ML and AI together as a single topic. ML is the computer learning subset of AI, but for this discussion, they can be thought of as one. Mathematics, which dates back to 3000 BC and basic arithmetic, is a field of study that uses formulas (sequences of symbols) to represent ideas and the real world. Sounds a bit abstract, right? It is, but think about it ... ML/AI by its nature is doing just that inside a computing device - representing ideas and the real world. So mathematics is naturally and ideally suited to the pursuits of ML/AI. ML/AI derives its tremendous power from the use of mathematics to, among other things, analyze probabilistic situations and outcomes. For example, an object recognition model might return the probability of .73 that a given photo contains the image of a cat. When we humans see a cat, we're usually pretty sure it's a cat. However, the combination of our senses and brains have done the complex mathematical-like analysis that produces that conclusion. Mathematics represents the calculations, estimations and processes needed to develop successful ML/AI models. Models are the embodiment in computer code of the mathematical representations used to perform ML/AI functions. In our example of a computer recognizing a cat in a photo, the ML/AI model represents the layers of processing needed to differentiate the image of a cat from all other possibilities. Below is a conceptual model of an Artificial Neural Network (ANN), one of the types of ML/AI mathematical models. Data (shown as lines) is passed in a forward left to right direction between processing nodes (shown as circles). Numerical weights (w) are applied to individual data flows and biases (b) are applied to nodes in order to shape the output, such as the identification of a cat in an input image. Mathematical methods such as Stochastic Gradient Descent (discussed above) are used to adjust the weights and biases as data is repeatedly passed through the ANN. ML/AI applications use mathematical models, such as those discussed above, to perform meaningful tasks and produce meaningful results. Raw ML/AI results from mathematical models can be very interesting, but by themselves offer little utility. ML/AI applications provide that utility. Android Fragments provide a mechanism to create modular sections of an Activity. You can see how Fragments fit into the overall Android structure in the blog post Android App Major Elements. You can see an example of Fragment use in the blog post Android Fragments. Fragments facilitate App adaptation to various screen sizes and dimensions. Fragments have their own life cycle that can be used to implement unique behavior for different App Fragments. Below is an overview of Fragments and the Android elements they interact with for Fragment control. The main Activity of an app uses the setContentView() method to establish a View. Activities can start and be started by Fragments. The View class represents the basic building block for user interface components. A View occupies a rectangular area on the screen and is responsible for drawing and event handling. View is the base class for widgets, which are used to create interactive UI components (buttons, text fields, etc.). Views can be accessed via their ids or from the Root View. The Root View is the base of the tree for all the Views for an app. It can be referenced using android.R.id.content. Layout XML can be used to define Views. When an app is compiled, the XML definitions are used to create View details. Note that this can include Fragment properties. If a Layout that includes a Fragment specification is used by the Activity setContentView() method, that Fragment will be automatically started by the Android operating system. A Fragment is a piece of an application's user interface or behavior that can be placed in an Activity. Sub classes of Fragment include: PreferenceFragment, DialogFragment and ListFragment. The FragmentManager class is an Interface for interacting with Fragment objects. The FragmentTransaction class is used for performing Fragment operations. There are hundreds of programming languages. Although most aren't commonly used, a software developer might use a number of them during their career. It's useful to understand the concepts that underlie these languages. Click here for a comparison of programming languages. Below are brief descriptions of some common and important programming constructs with links to more details. Separating ideas from specific instances of those ideas. Click here for more details. Define characteristics of constructs such as classes and methods. Examples of modifiers are: public, private, package and protected: Click here for more details. A data structure consisting of a collection of elements, each identified by at least one array index or key. Click here for more details. Defines a property of an object, element, or file. Click here for more details. Section of code grouped together. Click here for more information. Sequence of statements triggered by a conditional. Click here for more information. Pointer to a piece of executable code that is passed as an argument to other code, which is expected to call back (execute) the argument at some appropriate time. Click here for more details. Code template for creating objects. Think of architect's drawings. Click here for more details. Performs different actions depending on whether a condition is true or false. Click here for more details. In Object Oriented Programming, a block of code that's executed when an object is created. Click here for more details. An object made up of other objects. Click here for more details. Convention for representation and interaction between objects in HTML documents. Click here for more details. Variable sized data structure that allows adding and deleting elements. In Java, an ArrayList is one type of Dynamic Array. Click here for more information. Packing of data and functions into a single component. Click here for more details. Anomalous or failure event that may require special handling. Click here for more details. Combination of elements that produces a result. Click here for more details. Reclaiming of unused memory. In some operating systems, such as Android, Garbage Collection is automatic. Click here for more details. Used to provide direct access to data based on a calculated key. Click here for more details. A set of elements that can read by web browsers for displaying web pages. Click here for more details. Individual component of an HTML document. Click here for more details. Indicates the desired action to be performed on an identified resource. 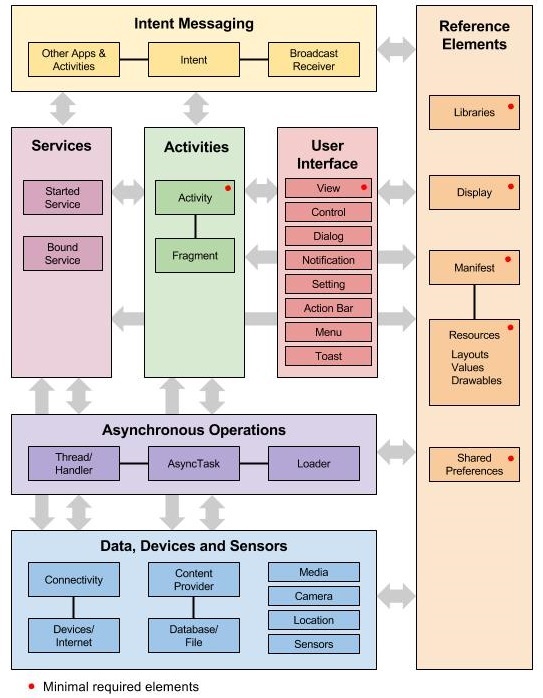 Actions include: GET, POST, HEAD, OPTIONS, PUT, DELETE, TRACE, PATCH and CONNECT. Click here for more details. Names for objects and entities. Click here for more details. Obtaining the capabilities on an object. Click here for more details. A Class that is declared entirely within the body of another class or interface. An inner class cannot be instantiated without being bound to a top-level class. Click here for more details. Specific realization of an object. Think of a house vs. the plans for a house. Click here for more details. An object that enables traversing a container, such as lists. Click here for more details. Human-readable text used to transmit data objects consisting of attribute–value pairs. Often used to transmit data between a server and web application. Click here for more details. Word with a special meaning. Click here for more details. A sequence of values, where the same value may occur more than once. Click here for more details. A data structure consisting of a group of nodes which together represent a sequence. Click here for more details. Notation representing a fixed value. Click here for more details. A sequence of statements which is specified once but can be carried out multiple times in succession. Click here for more details. A class whose instances are classes. Click here for more details. Code that defines the run time behavior of objects. Click here for more details. A class which contains a combination of methods from other classes without using inheritance. Click here for more details. Not available in pure Java. In Object Oriented Programming, an object is an instance of a class. Click here for more details. Perform actions on elements such as variables. Click here for more details. Ability to create multiple methods of the same name with different implementations. Click here for more details. In object oriented programming, is a language feature that allows a subclass or child class to provide a specific implementation of a method that is already provided by one of its superclasses or parent classes. Click here for more details. A Java package is a mechanism for organizing Java classes into namespace groups. Click here for more information. A reference or value passed to a function, procedure, subroutine, command, or program. Click here for more details. Provision of a single interface to entities of different types. Click here for more details. Smallest 'unit of processing' available to a programmer of a particular machine, or can be an atomic element of an expression in a language. Click here for more details. For example, in Java, primitive data types are: byte, short, int, long, float, double, boolean and char. Ability to modify an object's own properties at runtime. Click here for more details. Sequence of characters that can be used as a search pattern. Sometimes referred to as Regex or Regexen. Click here for more details. A word that cannot be used as an identifier, such as the name of a variable or function. Click here for more details. A value that is passed from a calculating function to an invoking function. Click here for more details. Functions that put elements in a certain order. Sorting is used so often that many programming languages have built-in sort functions. Click here for more information. Expresses some action to be carried out. Click here for more details. Control mechanism used to allow the value of a variable or expression to change the control flow of program execution. Click here for more details. A collection of related data held in a structured format within a database. It consists of fields (columns), and rows. Click here for more details. Refers to the object, class, or other entity that the currently running code is part of. Click here for more details. An object which represents the right to perform an operation. Click here for more details. Collection of rules for constructs such as variables and functions. Untyped languages allow any operation to be performed on any data type. Click here for more details. A storage location and associated name which contains a modifiable value. Click here for more details. This video, part of my Android Quick Code Access series of posts, explains Android Broadcast Receivers. It's from my course Learning Android App Programming published by InfiniteSkills. // Declare main activity for the application. // Define actions to be taken when broadcast is received. // Do the work of the BroadcastReceiver. // In this example, a message is toasted to the user. // of the main activity. // Register the receiver with its filter. // Unregister the receiver when the application is paused. 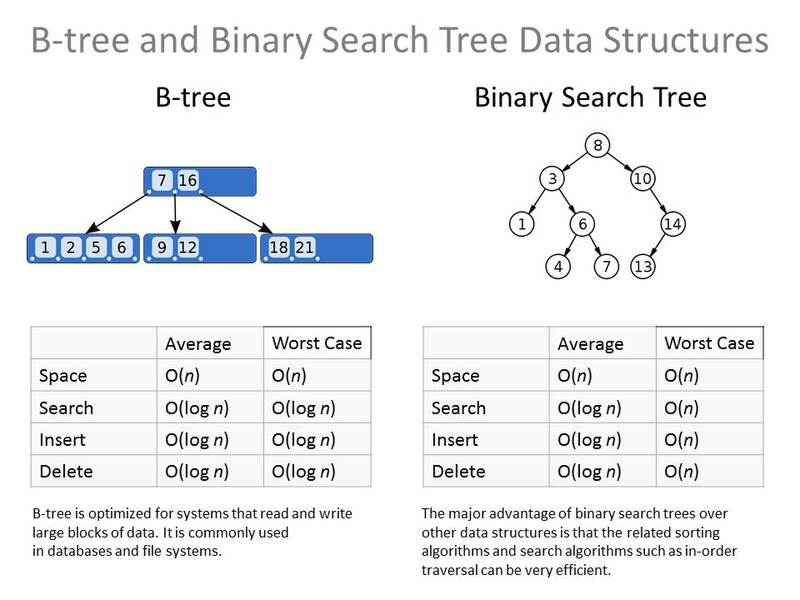 B-tree and Binary Search Tree data structures are similar but different ways to store data. The advantage of using search trees is that the test for membership can be performed efficiently provided that the tree is reasonably balanced, that is, the leaves of the tree are at comparable depths. B-tree implementations are normally commercial. Languages don't typically provide direct B-tree support. To find B-tree implementations, search Google for B-tree software. Some languages do provide support for Binary Search Trees. In Java, see the TreeMap class, which implements a variant of the Binary Search Tree, the Red-Black Tree. Both structures operate in the average in O(log n) time. Note that in the worst case, B-tree, at O(log n), is faster than Binary Search Tree at O(n).